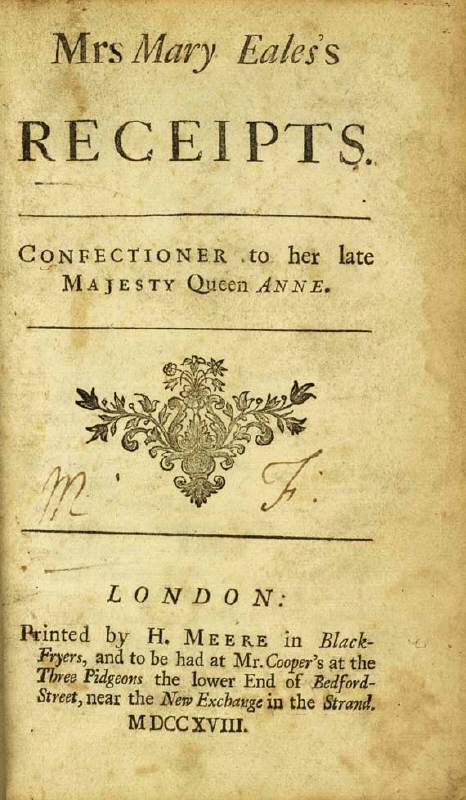 CONFECTIONER to her late MAJESTY Queen ANNE. 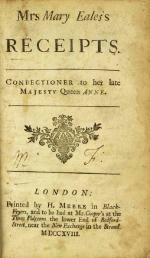 Printed for J. BRINDLEY, Bookseller, at the King's-Arms in New Bond-Street, and Bookbinder to Her Majesty and His Royal Highness the Prince of Wales; and R. MONTAGU at the General Post-Office, the Corner of Great Queen-Street, near Drury-Lane. Take the Stalks of Angelica, and boil them tender; then put them to drain, and scrape off all the thin Skin, and put them into scalding Water; keep them close cover'd, and over a slow Fire, not to boil, 'till they are green; then draining them well, put them in a very thick Syrup of the Weight and half of Sugar: Let the Syrup be cold when you put them in, and warm it every Day 'till it is clear, when you may lay them out to dry, sifting Sugar upon them. Lay out but as much as you use at a Time, and scald the rest. Take Apricocks before the Stones are very hard; wet them, and lay them in a coarse Cloth; put to them two or three large Handfuls of Salt, rub them 'till the Roughness is off, then put them in scalding Water; set them over the Fire 'till they almost boil, then set them off the Fire 'till they are almost cold; do so two or three Times; after this, let them be close cover'd; and when they look to be green, let them boil 'till they begin to be tender; weigh them, and make a Syrup of their Weight in Sugar, to a Pound of Sugar allowing half a Pint of Water to make the Syrup; let it be almost cold before you put in the Apricocks; boil them up well 'till they are clear; warm the Syrup daily, 'till it is pretty thick. You may put them in a Codling-Jelly, or Hartshorn Jelly, or dry them as you use them. Take a Gallon of white Goosberries, nose and wash them; put to them as much Water as will cover them almost all over, set them on an hot Fire, let them boil a Quarter of an Hour, or more, then run it thro' a Flannel Jelly-Bag; to a Pint of Jelly have ready a Pound and half of fine Sugar, sifted thro' an Hair Sieve; set the Jelly over the Fire, let it just boil up, then shake in the Sugar, stirring it all the while the Sugar is putting in; then set it on the Fire again, let it scald 'till all the Sugar is well melted; then lay a thin Strainer in a flat earthen Pan, pour in your Clear-Cake Jelly, and turn back the Strainer to take off the Scum; fill it into Pots, and set it in the Stove to dry; when it is candy'd on the Top, turn it out on Glass; and if your Pots are too big, cut it; and when it is very dry, turn it again, and let it dry on the other Side; twice turning is enough. If any of the Cakes stick to the Glass, hold them over a little Fire, and they will come off: Take Care the Jelly does not boil after the Sugar is in: A Gallon of Goosberries will make three Pints of Jelly; if more, 'twill not be strong enough. Take the Goosberries, nose and wash them, put to them as much Water as will almost cover them, and let them boil a Quarter of an Hour; then strain them thro' a thin Strainer, or an Hair-Sieve, and allow to a Pint of Liquor a Pound and half of fine Sugar, sifted thro' a Hair-Sieve; before you put in the Sugar, set the Liquor on the Fire, let it boil, and scum it; then shake in the Sugar, set it on the Fire again, and let it scald 'till all the Sugar is melted; then fill it into little Pots; when it is candy'd, turn it out on Glass; and when it is dry on one Side, turn it again; if any of the Cakes stick, hold the Glass over the Fire: You may put some of this in Plates; and when it is jelly'd, before it candies, cut it out in long Slices, and make Fruit-Jambals. Take the white Goosberries, stamp and strain them; then take the largest white Goosberries when they just begin to turn, stone them, and to half a Pound of the Goosberries put a Pound of Loaf Sugar beaten very fine, half a Pint of the Juice of that which is strain'd, (but let it stand 'till it is settled and very clear) and six Spoonfuls of Water; set them on a very quick Fire; let them boil as fast as you can make them, up to the Top of the Pan; when you see the Sugar as it boils look clear, they are enough, which will be in less than half a quarter of an Hour: Put them in Pots or Glasses, paper them close; the next Day, if they are not hard enough jelly'd, set them for a Day or two on an hot Stove, or in some warm Place, but not in the Sun; and when they are jelly'd, put Papers close to 'em; the Papers must be first wet, and then dry'd with a Cloth. Stone the Cherries; and to ten Pound of Cherries, when they are ston'd, put three Pound of Sugar very fine beaten; shake the Cherries and Sugar well together, set them on the Fire, and when the Sugar is well melted, give them a Boil or two; let them stand in an earthen Pot 'till the next Day, then make them scalding hot, and, when cold, lay them on Sieves; afterwards put them in an Oven not too hot, where let them stand all Night, and then turn them, and put them in again. Let your Oven be no hotter than it is after small Bread or Pies. When they are dry, keep them in a Box very close, with no Paper between them. Take twelve Pound of ston'd Cherries, boil them, break them as they boil; and when you have boiled all the Juice away, and can see the Bottom of the Pan, put in three Pound of Sugar finely beaten, stir it well, and let them have two or three Boils; then put them in Pots or Glasses. To dry CHERRIES without Sugar. Stone the Cherries, and set them on the Fire, with only what Liquor comes out of them; let them boil up two or three Times, shaking them as they boil; then put them in an earthen Pot; the next Day scald them, and when they are cold lay them on Sieves, and dry them in an Oven not too hot. Twice heating an Oven will dry any Sort of Cherries. To dry CHERRIES in Bunches. Take Kentish Cherries, or Morella, and tye them in Bunches with a Thread, about a Dozen in a Bunch; and when you have dry'd your other Cherries, put the Syrup that they come out of to your Bunches; let them just boil, cover them close, the next Day scald them; and when they are cold, lay them in Sieves in a cool Oven; turn them, and heat the Oven every Day 'till they are dry. Take Cherries, stone and boil them, breaking them well the while, and boil them very dry; and to a Pound of Cherries put a Pound and a Quarter of Sugar, sifted thro' an Hair Sieve; let the Cherries be hot when you put in the Sugar; set it on the Fire 'till the Sugar is well melted; put it in a broad Pan, or earthen Plates; let it stand in the Stove 'till it is candy'd; drop it on Glass, and, when dry on one Side, turn it. Either Morella or Carnations, stone the Cherries: To Morella Cherries, take the Jelly of white Currants, drawn with a little Water; and run thro a Jelly-bag a Pint and a half of the Jelly, and three Pounds of fine Sugar; set it on a quick Fire; when it boils, scum it, and put in two Pounds of the ston'd Cherries; let them not boil too fast at first, take them off some Times; when they are tender, boil them very fast 'till they jelly, and are very clear; then put them in the Pots or Glasses. The Carnation Cherries must have red Currants-Jelly; and if you can get no white Currants, Codling-Jelly will serve for the Morella. To dry CURRANTS in Bunches or loose Sprigs. When your Currants are ston'd and ty'd up in Bunches, take to a Pound of Currants a Pound and half of Sugar; to a Pound of Sugar put half a Pint of Water; boil your Syrup very well, and lay the Currants into the Syrup; set them on the Fire, let them just boil, take them off, and cover them close with a Paper; let them stand 'till the next Day, and then make them scalding hot; let them stand two or three Days with the Paper close to them; then lay them on earthen Plates, and sift them well with Sugar; put them into a Stove; the next Day lay them on Sieves, but not turn them 'till that Side drys, then turn them, and sift the other Side: When they are dry lay them between Papers. Strip the Currants, wash them, and to a Gallon of Currants put about a Quart of Water; boil it very well, run it thro' a Jelly-bag; to a Pint of Jelly put a Pound and half of Sugar, sifted thro' an Hair Sieve; set your Jelly on the Fire, let it just boil; then shake in the Sugar, stir it well, set it on the Fire, and make it scalding hot; then put it thro' a Strainer in a broad Pan, to take off the Scum, and fill it in Pots: When it is candy'd, turn it on Glass 'till that Side be dry; then turn it again, to dry on the other Side. Red and white Currants are done the same Way; but as soon as the Jelly of the White is made, you must put it to the Sugar, or it will change Colour. Mash the Currants, and strain them thro' a thin Strainer; take a Pint of Juice, a Pound and half of Sugar, and six Spoonfuls of Water; let it boil up, and scum it very well; then put in half a Pound of ston'd Currants; boil them as fast as you can, 'till the Currants are clear and jelly very well; put them in Pots or Glasses, and, when they are cold, paper them as other Sweet-meats. Stir all small Fruit as they cool, to mix it with the Jelly. To make CURRANT-PASTE, either Red or White. Strip the Currants, and put a little Water to them, just to keep them from sticking to the Pan; boil them well, and rub them thro' a Hair Sieve: To a Pint of Juice put a Pound and a half of Sugar sifted; but first boil the Juice after it is strain'd, and then shake in your Sugar: Let it scald 'till the Sugar is melted; then put it in little Pots in a Stove, and turn it as other Paste. Take the large white Currants, not the Amber-colour'd, strip them, and to two Quarts of Currants put a Pint of Water; boil them very fast, and run them thro' a Jelly-bag; to a Pint of Juice put in a Pound and half of Sugar, and half a Pound of ston'd Currants; set them on a quick Fire, let them boil very fast, 'till the Currants are clear and jelly very well; then put them in Pots or Glasses; stir them as they cool, to make the Currants mix with the Jelly: Paper them down when almost cold. Take the Juice of red and white Rasberries; (if you have no white Rasberries, use half Codling-Jelly) put a Pint and half of the Juice to two Pound of Sugar; let it boil, scum it, and then put in three Quarters of a Pound of large Rasberries; let them boil very fast, 'till they jelly and are very clear; don't take them off the Fire, for that will make them hard; a Quarter of an Hour will do them after they begin to boil fast; then put them in Pots or Glasses: Put the Rasberries in first, then strain the Jelly from the Seeds, and put it to the Rasberries. When they begin to cool, stir them, that they may not all lye upon the Top of the Glasses; and when they are cold, lay Papers close to them; first wet the Paper, then dry it in a Cloth. To make JAM of RASBERRIES. Take the Rasberries, mash them, and strain half; put the Juice to the other half that has the Seeds in it; boil it fast for a Quarter of an Hour; then to a Pint of Rasberries put three Quarters of a Pound of Sugar, and boil it 'till it jellies: Put it into Pots or Glasses. Mash the Rasberries, strain half, and put the Juice to the other half with the Seeds; boil them fast for a Quarter of an Hour; and to a Pint of Rasberries put half a Pint of red Currants, boil'd with very little Water, and strain'd thro' a thin Strainer, or Hair Sieve; let the Currants and Rasberries boil together a little while: Then to a Pint of Juice put a Pound and a Quarter of sifted Sugar; set it over the Fire, let it scald, but not boil; fill it in little Pots, set it in the Stove 'till it is candy'd, then turn it out on Glasses, as other Cakes. Take half Rasberries and half white Currants, almost cover them with Water; boil them very well a Quarter of an Hour, then run them thro' a Jelly-bag, and to every Pint of Jelly have ready a Pound and half of fine Sugar, sifted thro' an Hair Sieve; set the Jelly on the Fire, let it just boil, then shake in your Sugar, stir it well, and set it on the Fire a second Time, 'till the Sugar is melted; then lay a Strainer in a broad Pan to prevent the Scum, and fill it into Pots: When it is candy'd, turn it on Glass, as other Clear-Cakes. Mash the Rasberries, put in a little Water, boil and strain them, then take half a Pound of fine Sugar, sifted thro' an Hair Sieve; just wet the Sugar to make it as thick as a Paste; put to it twenty Drops of Spirits of Vitriol, set it over the Fire, making it scalding hot, but not to boil: Drop it on Paper it will soon be dry; if it will not come off easily, wet the Paper. Let them lye a Day or two on the Paper. Take four Dozen and a half of the largest Apricocks, stone them and pare them; cover them all over with four Pound of Sugar finely beaten; put some of the Sugar on them as you pare them, the rest after: Let them lye four or five Hours, 'till the Sugar is almost melted; then set them on a slow Fire 'till quite melted; then boil them, but not too fast. As they grow tender, take them out on an earthen Plate 'till the rest are done; then put in those that you laid out first, and let them have a Boil together: Put a Paper close to them, and let them stand a Day or two; then make them very hot, but not boil; put the Paper on them as before, and let them stand two Days, then lay them on earthen Plates in a Stove, with as little Syrup on them as you can; turn them every Day 'till they are dry, and scrape off the Syrup as you turn them; lay them between Paper, and let them not be too dry before you lay them up. To dry APRICOCKS in Quarters or Halves. Take four Pound of the Halves or Quarters, pare them, and put to them three Pound of Sugar fine beaten; strew some on them as you pare them, and cover them with the rest; let them lye four or five Hours; afterwards set them on a slow Fire, till the Sugar is melted; then boil them, but not too fast, 'till they are tender, taking out those that are first tender; and putting them in again, let them have a Boil together; then lay a Paper close to them, scald them very well, and let them lye a Day or two in the Syrup: Lay them on earthen Plates, with as little Syrup to them as you can, turning them every Day 'till they are dry; at last, lay them between Paper in Boxes. As you pare your Apricocks, save the clearest Parings, and throw a little Sugar on them; half a Pound is sufficient to a Pound of the Parings; set them on the Fire, let them just boil up, and set them by 'till the next Day; drain the Syrup from them, and make a Syrup with a Pound of Sugar and almost half a Pint of Water; boil the Sugar very well, and put as much to the Chips when it is cold as will cover them; let them stand in the Syrup all Night, and the next Day make them scalding hot; and when they are cold, lay them out on Boards, sift them with Sugar, and turn them on Sieves. Take four Dozen of large Apricocks, stone and pare them, and cover them with three Pound of fine beaten Sugar, strewing some on as you pare them; let them stand, at least, six or seven Hours, then boil them on a slow Fire 'till they are clear and tender; if some of them are clear before the rest, take them out, and put them in again when the rest are ready. Let them stand, with a Paper close to them, 'till the next Day; then make Codling-Jelly very strong: Take two Pints of Jelly, two Pound of Sugar, boil it 'till it jellies; and whilst it is boiling, make your Apricocks scalding hot, and put the Jelly to your Apricocks, and boil them together, but not too fast. When the Apricocks rise in the Jelly, and they jelly very well, put them into Pots or Glasses, with Papers close to them. Take about three Dozen of Apricocks, pare them, and put thereto a Pound of fine Sugar, and boil them to Pieces; then put to them two Quarts of Codling-Jelly, boil them together very fast for a Quarter of an Hour; run it thro' a Jelly-bag, and to a Pint of Jelly put a Pound and half of Sugar, sifted thro' a Hair Sieve; while the Jelly boils, shake in your Sugar, and let it scald 'till the Sugar is melted; then put it thro' a thin Strainer, in a broad earthen Pan; fill it in Pots, and dry it as other Clear-Cakes. If you would have some with Pieces in them, cut some of your dry'd Quarters small; and when the Strainer has taken off the Scum, take some of the Jelly in a Pan, put in the Pieces, make it scalding hot again, and fill it out. Take two Pound of Apricocks par'd, and a Pound of Sugar fine beaten, let them lye in the Sugar 'till it is melted; then boil it well and mash it very small; put to it two Pints of Codling-Jelly; let it boil together; and to a Pound of it put a Pound and a Quarter of sifted Sugar; let your Paste boil before you put your Sugar to it, then let it scald 'till the Sugar is melted; fill it in Pots, and dry it in the Stove, turning it as other Paste. To make APPLE-JELLY for all Sorts of SWEET-MEATS. Let your Water boil in the Pan you make it in; and when the Apples are par'd and quarter'd, put them into the boiling Water; let there be no more Water than just to cover them, and let it boil as fast as possible; when the Apples are all to Pieces, put in about a Quart of Water more; let it boil at least half an Hour; and then run it thro' a Jelly-bag: In the Summer, Codlings are best; in September, Golden Runnets and Winter Pippins. Take two Pound of Apricocks par'd, and a Pint of Codling-Jelly, boil them very fast together 'till the Jelly is almost wasted; then put to it a Pound and half of fine Sugar, and boil it very fast 'till it jellies; put it into Pots or Glasses. You may make fresh Clear-Cakes with this, and Pippin-Jelly, in the Winter. Cut out the Stalk and Nose, and put them in cold Water on a Coal-Fire 'till they peel; then put them in the same Water, and cover them very close; set them on a slow Fire 'till they are green and tender; then, to a Pound of Apples take a Pound and half of Sugar, and half a Pint of Water; boil the Syrup, put in the Apples, and boil them fast, 'till they are very clear, and the Syrup very thick, almost at a Candy; then put in half a Pint, or more, of Codling-Jelly, and the Juice of a Lemon, boil it 'till it jellies well, and put them in Pots or Glasses. Take the green Amber Plum, prick it all over with a Pin; make Water boiling hot, and put in the Plums, be sure you have so much Water, that it be not cold with the Plums going in; cover them very close, and when they are almost cold, set them on the Fire again, but not to let them boil; do so three or four Times; when you see the thin Skin crack'd, fling in a Handful of Allum fine beaten, and keep them in a Scald 'till they begin to be green, then give them a Boil close cover'd: When they are green, let them stand all Night in fresh hot Water; the next Day have ready as much clarify'd Sugar as will cover them; drain your Plums, put them into the Syrup, and give them two or three Boils; repeat it two or three Days, 'till they are very clear; let them stand in their Syrup above a Week; then lay them out on Sieves, in a hot Stove, to dry: If you would have your Plums green very soon, instead of Allom, take Verdigreece finely beaten, and put in Vinegar; shake it in a Bottle, and put it into them when the Skin cracks; let them have a Boil, and they will be very soon green; you may put some of them in Codling-Jelly, first boiling the Jelly with the Weight in Sugar. To dry AMBER, or any WHITE PLUMS. Slit your Plums in the Seam; then make a thin Syrup. If you have any Apricock-Syrup left, after your Apricocks are dry'd, put a Pint of Syrup to two Quarts of Water; if you have none, clarify single-refin'd Loaf-Sugar, and make a thin Syrup: Make the Syrup scalding hot, and put in the Plums; there must be so much Syrup as will more than cover the Plums; they must be kept under the Syrup, or they will turn red: Keep them in a Scald 'till they are tender, but not too soft; then have ready a thick Syrup of the same Sugar, clarify'd and cold, as much as will cover the Plums; let them boil, but not too fast, 'till they are very tender and clear, setting them sometimes off the Fire; then lay a Paper close to them, and set them by 'till the next Day; then boil them again 'till the Syrup is very thick; let them lye in the Syrup four or five Days, then lay them on Sieves to dry: You may put some in Codling-Jelly, first boiling the Jelly with the Weight in Sugar, and put in the Plums hot to the Jelly. Put them in Pots or Glasses. To dry BLACK PEAR-PLUMS, or MUSCLES, or the GREAT MOGULS. Stone your Plums, and put them in a large earthen Pot; make a Syrup with a Pound of single-refin'd Sugar and three Pints of Water; or if you have the Syrup the white Plums are dry'd out of, thin it with Water, it will do as well as Sugar; boil your Syrup well, and when it is cold enough to hold your Hand in it, put it to the Plums; cover them close, and let them stand all Night; heat the Syrup two or three Times, but never too hot; when they are tender, lay them on Sieves, with the Slit downwards to dry; put them in the Oven, made no hotter than it is after Bread or Pyes come out of it; let them stand all Night therein; then open them and turn them, and set them in a cool Oven again, or in an hot Stove, for a Day or two; but if they are too dry, they will not be smooth; then make a Jam to fill them with. Take ten Pound of Plums, the same Sort of your Skins, cut them off the Stones, put to them three Pound of Powder-Sugar; boil them on a slow Fire, keeping them stirring 'till it's so stiff, that it will lye in a Heap in the Pan; it will be boiling at least four or five Hours; lay it on Earthen Plates; when it is cold, break it with your Hands, and fill your Skins; then wash every Plum, and wipe all the Clam off with a Cloth: As you wash them, lay them on a Sieve; put them in the Oven, make your Oven as hot as for your Skins; let them stand all Night, and they will be blue in the Morning. The great white Mogul makes a fine black Plum; stone them, and put them in the Syrup with or after the black Plum; and heat the Syrup every Day, 'till they are of a dark Colour; they will blue as well as the Muscles, and better than the black Pear-Plums. If any of these Plums grow rusty in the Winter, put them into boiling hot Water; let them lye no longer than to be well wash'd: Lay them on a Sieve, not singly, but one on the other, and they will blue the better: Put them in a cool Oven all Night, they will be as blue and fresh as at first. To preserve BLACK PEAR-PLUMS or DAMASCENES. Take two Pound of Plums, and cut them in the Seam; then take a Pint and half of Jelly, made of the same Plum, and three Pound and a half of Sugar; boil the Jelly and Sugar, and scum it well; put your Plums in a Pot; pour the Jelly on them scalding hot: When they are almost cold, heat them again; so do 'till they are tender, and then let them stand two or three Days, heating them every Day; then boil them 'till they look clear and jelly: Don't boil them too fast. Slit your Plums, and scald them in a thin Syrup; as for drying them, put them in a thick Syrup of clarify'd Sugar, as much as will cover them; let them boil very slow, 'till they are very clear, sometimes setting them, off the Fire: They must have the Weight, or something more, of clarify'd Sugar in the Syrup: When they are very tender and clear, put to a Pound of Plums (when they are raw) a Pint of Apple-Jelly, and a Pound of fine Sugar, and boil it 'till it jellies; before your Plums are cold put them into the Jelly, but not above half the Syrup they were boil'd in, and boil them together 'till they jelly well: Put them in Pots or Glasses, with Papers close to them. You may keep some of them in Syrup, and put them in Jelly as you use them. To make WHITE PEAR-PLUM CLEAR-CAKES. Take a good Quantity of white Pear-Plums, as many as you think will make three Pints, with as much boiling Water as will cover them; boil them very fast, 'till they are all to Pieces; then have ready three Pints of Apple-Jelly, and put it to the Plums, boiling them very fast together; then run it thro' a Jelly-bag: To a Pint put a Pound and half of sifted Sugar; first boil the Jelly, and shake in the Sugar; let it scald on the Fire 'till it is melted; put it in Pots in the Stove; dry and turn it as other Clear-Cakes. Take a Pound of fine Sugar, and a Pint of Water, or more, as the Quantity you intend to make requires; set it on the Fire, let it boil, and set a Pan of Water to boil; when it boils, put in your Plums; let them just boil, and then take them out with a Ladle, as they flip their Skins off; take off the Skins, and put the Plums into the Syrup; do this as fast as you can, that they may not turn: Boil them all to Pieces; and to a Quart of Plums put a Pint of Apple-Jelly; boil them well together, and rub it thro' a Hair Sieve; to a Pint of this put a Pound and a half of sifted Sugar; let the Jelly boil before you shake the Sugar, and let it scald 'till the Sugar is well melted; skin it, put it in Pots, and dry it in the Stove. To make RED PLUM CLEAR-CAKES. Take white Pear-Plums, half White and half Black, or if you have no Black, one third of Damsins, and as much Water as will cover them; boil them very well; and to a Quart of the Plums put a Quart of Apple-Jelly; boil them very well together; run it thro' a Jelly-bag; to a Pint of the Jelly put a Pound and Half of Sugar; let the Jelly boil, then shake in the Sugar; let it scald, but not boil; put it thro' a thin Strainer in a broad Pan, to take off the Scum, and put it in Pots in a Stove: When it is candy'd, turn it as other Clear-Cakes: You may make it paler or redder, as you best like, with more or less black Plums. Take half white and half red Plums, as you did for the Clear-Cakes; boil them with as much Water as will cover them; then, to a Quart of Plums put a Pint of Apple-Jelly; let them boil well together; rub it thro' an Hair Sieve; to a Pint of Jelly put in a Pound and half of Sugar; boil the Jelly, and shake in the Sugar; let it scald 'till the Sugar is melted, skin it well, and fill in Pots; dry it as other Cakes: You may put some of this in Plates, and make Fruit-Jambals. To dry PLUMS like the FRENCH PLUMS, with Stones in them. When you have laid out all your Plums that are to be stopt, put white Pear-Plums, or any large black Plums, in an Earthen Pot, and make your Plum-Syrup almost scalding hot; put it to the Plums, and scald the Syrup every Day, 'till the Plums are tender and red; then lay them on Sieves, and dry them in an Oven, turning them every Day 'till they are dry; then lay them between Papers, and keep them in a dry Place. Stone the largest white Newington Peaches, and pare them, and have ready a Pan over the Fire with boiling Water; put in the Peaches, and let them boil 'till they are tender; then lay them on a Sieve to drain out all the Water; weigh them, and lay them in the Pan you boil them in, and cover them with their Weight in Sugar; let them lye two or three Hours; then boil them 'till they are clear, and the Syrup pretty thick; set them by cover'd, with a Paper close to them; the next Day scald them very well, setting them off the Fire and on again, 'till the Peaches are thorough hot; repeat this for three Days; then lay them on Plates to dry, and turn them every Day 'till dry. Pare the Peaches, and cut them in thin Chips; to four Pound of Chips put three Pound and a Half of fine beaten Sugar; let the Sugar and Chips lye a little while, 'till the Sugar is well melted, then boil them fast 'till they are clear; about half an Hour will do them enough; set them by 'till the next Day, then scald them very well two Days, and lay them on earthen Plates in a Stove; sift on them fine Sugar, through a Lawn Sieve; turn them every Day, sifting them 'till almost dry; then lay them on a Sieve a Day or two more in the Stove: Lay them in a Box close together, and when they have lain so a Week, pick them asunder, that they may not be in Lumps. To preserve or dry NUTMEG-PEACHES. Peel the Peaches, and put them in boiling Water; let them boil a Quarter of an Hour; lay them to drain, weigh them, and to a Pound of Peaches put a Pound of fine Sugar beaten very small; when the Sugar is pretty well melted, boil them very fast 'till they are clear; set them by 'till they are cold; then scald them very well; take to every Pint of Peach a Pint of Codling-Jelly and a Pound of Sugar; boil it 'till it jellies very well, then put in the Peaches and half the Syrup; let them boil fast; then put them in Pots or Glasses: If you wou'd dry them, scald them three or four Days, and dry them out of their Syrup. Take Cucumbers of the same Bigness that you wou'd to pickle; pick them fresh, green, and free from Spots; boil them in Water 'till they are tender; then run a Knitting-needle through them the long Way, and scrape off all Roughness; then green them, which is done thus: Let your Water be ready to boil, take it off, and put in a good Piece of Roach-Allum; set it on the Fire, and put in the Cucumbers; cover them close 'till you see they look green; weigh them, and take their Weight in single-refin'd Sugar clarify'd; to a Pound of Sugar put a Pint of Water; put your Cucumbers in; boil them a little close-cover'd; set them by, and boil them a little every Day for four Days; then take them out of your Syrup, and make a Syrup of double-refin'd Sugar, a Pound of Sugar and half a Pint of Water to every Pound of Cucumbers; put in your Cucumbers, and boil them 'till they are clear; then put in the Juice of two or three Lemmons, and a little Orange-flower-water, and give them a Boil altogether: You may either lay them out to dry, or keep them in Syrup; but every Time you take any out, make the other scalding hot, and they will keep two or three Years. Take the white Figs at the full Bigness, before they turn Colour; slit them at the Bottom; put your Figs in scalding Water; keep them in a Scald, but not boil them 'till they are turn'd yellow; then let them stand 'till they are cold; they must be close cover'd, and something on them to keep them under Water; set them on the Fire again, and when they are ready to boil, put to them a little Verdigrease and Vinegar, and keep them in a Scald 'till they are green; then put them in boiling Water; let them boil 'till they are very tender; drain them well from the Water, and to every Pound clarify a Pound and Half of single-refin'd Sugar, and when the Sugar is cold put in the Figs; let them lye all Night in the cold Syrup; the next Day boil them 'till they are very clear, and the Syrup thick, and scald them every Day for a Week; then lay them to dry in a Stove, turning them every Day; weigh your Figs when they are raw; and when you clarify your Sugar, put half a Pint of Water to a Pound of Sugar: If your Figs grow too dry, you may put them in their Syrup again; they will look new to the End of the Year. Weigh the Figs, and slit them at the Bottom; put them into boiling Water, and boil them 'till they are very tender; drain them well from the Water; then make a Syrup of clarify'd single-refin'd Loaf-Sugar, with their Weight, and half a Pint of Water to a Pound of Sugar; when the Syrup is cold put in your Figs; let them lye all Night; the next Day boil them 'till they are very clear, and scald them every Day 'till the Syrup is very thick; then lay them out as you use them; but heat the Syrup after you have taken some out, or they will not keep: If they grow too dry, you may put them in the Syrup again, scalding the Syrup. Peel the Grapes and stone them; put them in a Pan, cover them very close; first let them boil, and set them sometimes on and off the Fire, 'till they are very green; then drain all the Juice from them; and to a Pint of Grapes put a Pound and a Half of Sugar, and half a Pint of Apple-Jelly; let them boil very fast 'till they are clear, and jelly very well: Put them in Pots or Glasses, with Paper close to them. Take the large Bell-Grapes, just before they are ripe; stone them in Bunches, and put them into scalding Water, covering them close with Vine-Leaves, and a Cover on the Pan; keep them in a Scald, putting them on and off the Fire 'till they are green; then give them a Boil in the Water, drain them on a Sieve, and to every Pound of Grapes make a thick Syrup of a Pound and a Half of clarify'd Sugar; and when the Syrup is cold, put in the Grapes, and scald them every Day 'till the Syrup is thick, but never let them boil; then lay them out on Earthen Plates, and sift them very well with Sugar; dry them in a Stove, and turn and sift them every Day. Take Barberries, stone them, and tye them in Bunches, or loose in Sprigs, which you please; weigh them, and to every Pound of Barberries clarify two Pound of Sugar; make your Syrup with something more than half a Pint of Water to a Pound of Sugar; put the Barberries into the Syrup when it is scalding hot; set it on the Fire, and let them just boil; then set them by, with a Paper close to them; the next Day make them scalding hot, doing so for two Days; but be sure they never boil after the first Time; when they are cold, lay them out on Earthen Plates; sift them well with Sugar, and the next Day turn them on a Sieve; sift them again, and turn them every Day 'till they are dry: Your Stove must not be too hot. Stone the Barberries in Sprigs; and to a Pound of Barberries make a Syrup of a Pound and a Half of fine Sugar, with half a Pint of Water to a Pound of Sugar: Put the Barberries in the Syrup, and let them have a Boil; scald them every Day for four or five Days, but don't let them boil: Put them in a Pot, and when you use any, heat the rest, or they will not keep. Take a good Quantity of Barberries, strip them off the Stalks; put to them a little Water, to keep them from Burning; boil them, and mash them as they boil, till they are very dry; then rub them through an Hair Sieve, and afterwards strain them through a Strainer, that there may be none of the black Noses in it; make it scalding hot, and to half a Pint of the Pulp put a Pound of the sifted Sugar; let it scald, and drop it on Boards or Glasses; then put it in a Stove, and turn it when it is candy'd. Pare Quinces, and quarter them, putting as much Water as will cover them, and boil them all to Pieces to make Jelly; run it through a Jelly-bag; then take a Pound of Quince, pare, quarter, and cut out all the Hard of it; and to a Pound of Quinces put a Pound and a Half of Sugar fine beaten, and half a Pint of Water, and let it boil 'till it is very clear; keep it stirring, and it will break as much as shou'd be; when the Sugar is boil'd to be very thick, almost a Candy, put in half a Pint of Jelly, and let it boil very fast 'till it jellies: As soon as you take it off, put in the Juice of a Lemon; skim it well, and put it in Pots or Glasses: It is the better for having Lumps in it. Pare the Quinces, quarter them, and cut out all that is hard; to a Pound of Quinces put in a Pound and a Half of Sugar, and half a Pint of Juice of Barberries, boil'd with Water, as you do Jelly, or other Fruit; boil it very fast, and break it very small; when it is all to Pieces, and jellies, it is enough: If you wou'd have the Marmalet of a very fine Colour, put a few black Bullace to the Barberries when you make the Jelly. Take a Pound of Quince par'd and quarter'd, cut out all the Hard, put to it a Pound of fine Sugar and half a Pint of Water, and let it boil very fast 'till it is all to Pieces; take it off the Fire, and break it very well, that there be no Lumps in it; boil it 'till it is very thick and well jelly'd; then take fine Muslin, and put your Quinces into it, and tye it up round. This Quantity will make three Quinces. Set them into three Pots, or China Cups, that will just hold one; cut off the Stalk-End of the Quince, and put it in the Pot or Cup, to make a Dent in the Quince, that it may be like a whole Quince; let them stand two or three Days, that they may be very stiff; take them out of the Muslin, and make a strong Jelly with Apples and Quinces: Take two Pints of Jelly and two Pound of Sugar, boil it fast 'till it jellies very well; then put in the Quinces, and let them have two or three Boils to make them hot; put them in Pots or Glasses, with Paper close to them. Pare the Quinces, and slice them into Water; put them into boiling Water; let them boil fast 'till they are very tender, but not so soft as to break them: Take them out with a Skimmer, lay them on a Sieve 'till they are well drain'd, and have ready a very thick Syrup of clarify'd Sugar; put them into as much as will cover them, then boil them 'till they are very clear, and the next Day scald them; and if you see they want Syrup, put in a Pint more, but let it be very thick: Scald them twice more, then lay them out on Earthen Plates in a Stove, sift them well with Sugar: Turn them and sift them 'till they are dry. Pare the Quinces, and quarter them; to a Pound of Quince put half a Pound of Sugar and half a Pint of Water; boil it fast 'till the Quinces are all to Pieces; then rub it very fine, 'till there be no Lumps in it, and put to it a Pint of Jelly of Quince, boil'd with as much Water as will cover them, and run through a Jelly-bag; boil the Quinces Jelly together, and to a Pint of it put a Pound and a Quarter of fine Sugar; let it scald, but not boil, 'till the Sugar is melted; skim it, and put it in the Stove; turn it when it is candy'd; twice turning will do. Pare, quarter, and boil the Quince with as much Water as will cover it, putting in a little more as it boils, but not too much; let it be a very strong Jelly, and run it through a Jelly-bag; put a Pound and a Half of the finest sifted Sugar to a Pint of Jelly; let the Jelly boil, then put in the Sugar, and let it scald 'till the Sugar is melted; then put it through a Strainer, laid in a broad Earthen Pan; fill it in little Pots, and when it is hard candy'd, turn it on Glasses as other Clear-Cakes: Colour the Jelly, if you wou'd have any Red Quince Clear-Cakes, with the Jelly of black Bullace, and let it boil after the Red is in, before you put in the Sugar. To preserve GOLDEN or KENTISH-PIPPINS. Boil the Rind of an Orange very tender, and let it lye in Water two or three Days; then make a strong Jelly with Pippins, and run it through a Jelly-bag. Take Golden-Pippins, pare them, and scoop out all the Coar at the Stalk End: To twelve Pippins put two Pound of Sugar and three Quarters of a Pint of Water, boil the Sugar and skim it; put in the Pippins and the Orange-Rind cut into thin Slices; let them boil as fast as they can 'till the Sugar is very thick, and almost a Candy; then put in a Pint of the Pippin-Jelly, and boil them very fast 'till they jelly very well; then put in the Juice of a Lemmon, give it one Boil, and put them in Pots or Glasses, with the Orange mix'd with them. The Kentish Pippins are better in Quarters than whole. To preserve WHOLE ORANGES or LEMMONS. Rasp them very thin, just the Outside Rind off; lay them in Water twenty four Hours; then set them on the Fire with a good Quantity of Water; let them boil 'till they are very tender; then put them in cold Water again, and let them lye two Days; the Lemmons need not lye but one Day; then, to four Oranges or Lemmons put two Pound of fine Sugar and a Pint of Water; boil and skim it, and when it is cold, put in the Oranges or Lemmons, and let them lye four or five Days in cold Syrup; then boil them 'till they are clear; set them by in an Earthen Pan a Day or two more; then boil them again, and put them in Jelly, thus: Take Pippin-Jelly, and to a Pint put a Pound of fine Sugar; boil it 'till the Jelly is very strong; then heat your Oranges, and put them to the Jelly, with half their Syrup; boil them very fast a Quarter of an Hour; when you take them off the Fire, put in the Juice of two or three Lemmons; put them in Pots that will hold the Jelly: To four Oranges you may put one Pint and a Half of Jelly, and one Pound and a Half of Sugar. Lemmons must be done by themselves. Sevil Oranges and Malaga Lemmons are best. To dry ORANGES in KNOTS, or LEMMONS. Rasp the Oranges or Lemmons with a sharp Knife, as thin and as small as you can, and break the Rasping as little as you can, that the Outside Rind may make but two or three Knots; then cut the Oranges, and pick out all the Meat; and the white Rind makes another Sort of Knots: Let both the Rinds lye two Days in a Sieve, or broad Pan, before you boil them, or they will break; then put them in cold Water, and boil them about an Hour; let them drain well from the Water, and clarify as much single-refin'd Sugar as will cover them very well; when the Syrup is cold put them in, and let them stand four or five Days; dry them out as you use them; and when you take any out to dry, boil them which you leave in the Syrup. They must be candy'd out thus: Take as many as you desire to dry; the white Halves must be cut in Rings, or Quarters, as you like them; then take as much clarify'd Sugar as will cover them; boil them very fast a great while, 'till the Sugar shall blow, which you may see, if you put in a Ladle with Holes, and blow thro', you will see the Sugar fly from the Ladle; then take it off, and rub the Candy against the Pan Sides, and round the Bottom, 'till the Sugar looks Oily; then put them out on a Sieve, to let the Sugar run from them; and as quick as possible lay them in Knots on another Sieve; set them in a Stove, they will be dry in an Hour or two: If you do but a few at a Time, the Syrup you put to them at first will do them out. Whole Oranges or Lemmons are done the fame Way, only boil the whole after they are rasp'd, and cut a Hole at the Top, and pick out all the Meat after they are boil'd, and before they are put in the Syrup; and when they are laid on a Sieve to dry, put the Piece in again. Cut the Rind of China Oranges in long Chips, but very thin, and with none of the White; boil them in Water 'till they are very tender; then drain them, and put them into a very thick cold Syrup of clarify'd Sugar; let them lye a Day or two; then scald them, and when they are cold lay them to dry on Earthen Plates in a Stove. Sevil Oranges will do the same Way, if you like them with a little Sugar, and very bitter. Rasp the Oranges, and you may make the Outside for Knots; then cut the Oranges, and pick out all the Meat, and all the Stones from the Meat; boil the white Rinds very tender, drain them well, and beat them fine; to a Pint and half of the Meat put a Pound of the beaten Rind; mix it well, make it scalding hot; then put in three Pound of fine Sugar sifted thro' an Hair Sieve; stir it well in, and scald it 'till the Sugar is well melted; then put in the Juice of three large Lemmons: Put the Paste in flat Earthen Pans, or deep Plates; set it in the Stove 'till it is candy'd; then drop it on Glasses: Let what is too thin to drop stand 'till 'tis candy'd again: Once turning will dry it. Sevil Oranges make the best. Take about a Dozen Oranges, squeeze out the Juice, boil the Rind very tender, cut out most of the White, and beat the yellow Rind very fine; rub it thro' an Hair Sieve, and to a Pound of the Pulp put a Pound and a Half of fine Sugar, sifted thro' an Hair Sieve; mix it well in, and put in the Juice 'till you make it thin enough to drop from a Tea-Spoon: Drop it on Glasses, and set it by the Fire; let it stand there about two Hours, and then put it in a Stove; the next Day turn it: it will be dry in twenty four Hours. Rasp the Oranges, cut out the Meat, boil the Rinds very tender, and beat them very fine; then take three Pound of fine Sugar and a Pint of Water, boil and skim it; then put in a Pound of Rind, boil it fast 'till the Sugar is very thick; then put in a Pint of the Meat of the Orange, (the Seeds being pick'd out) and a Pint of very strong Pippin-Jelly; boil all together very fast, 'till it jellies very well, which will be half an Hour; then put it in Pots or Glasses, with Papers close to it. To make ORANGE or LEMMON CLEAR-CAKES. Make a very strong Pippin-Jelly; when it is run thro' a Jelly-bag, take a Quart of Jelly, and the Meat of three or four Oranges, boil them together, and rub it thro' a Jelly-bag again; then take a Quarter of a Pint of Orange-Juice, a Quarter of a Pound of fine Sugar, and let it have a Boil; then put it into your Jelly, but first measure your Jelly; put half the Syrup of the Oranges to a Pint of Juice, and the Outside of an Orange, boil'd in two or three Waters, and shred very fine; make them scalding hot together; then to a Pint of Jelly take a Pound and a Half of Sugar, boiling the Sugar to a Candy; then put in your Jelly, but not altogether; because if it all boil in the hot Sugar, it will not dry: As soon as it has done boiling, put in the rest; set it over the Fire 'till all the Candy is well melted; but take Care it does not boil; then fill it in little Pots, dry and turn it on Glasses, as other Clear-Cakes. Lemmons are done the same Way. Make a strong Pippin-Jelly, and slice a Lemmon into it, Rind and all; boil it well, and run it thro' the Jelly-bag again; then colour it as you like it: To a Pint of the Jelly take half a Quarter of Orange-Syrup, made as for Orange Clear-Cakes; let it have a Boil together, and boil a Pound and a Half of Sugar to a Candy; put your Jelly to the Candy, a little at a Time, 'till the Sugar has done boiling, then put in all the rest; scald it 'till the Candy is well melted, fill it in Pots, and dry it as other Clear-Cakes. The Colour is made thus: Take as much Carmine as you can have for Half-a-Crown, put to it two Ounces of Sugar, and as much Water as will wet it; give it a Boil, and then colour your Jelly with it. To make ORANGE-HALVES, or QUARTERS, with the Meat in them. Rasp the Oranges round and thin, cut them in Halves, pick out the Meat, boil the Halves very tender, then take half of them, that are clearest and best, and put them in a thick cold Syrup, as much as will cover them; the Syrup must be made with fine Sugar, half a Pint of Water to a Pound of Sugar; beat the other Half of the Rinds very fine; pick the Seeds out of the Meat; and to a Pint of the Meat put half a Pound of the beaten Rinds; scald it very well, and stir it into a Pound and a Half of sifted Sugar; scald it 'till the Sugar is well melted; put in the Juice of a Lemmon or two; set it in a broad Earthen Pan in a Stove; when the Half Orange-Rinds have lain three or four Days in the Syrup, boil them very fast 'till they are clear, and the Syrup very thick; when they are cold, lay them out on Earthen Plates in a Stove; the next Day, if you think they have not Sugar enough on them, dip them in the Syrup that runs from them; they must not have dry Sugar on them, but only a Gloss; before they are quite dry, fill them with the Meat; set them on a Sieve, to dry in a Stove, which will be in a Day or two. Take the largest Malaga Citrons, cut them in four Quarters, scrape the Rind a little, but not all the Yellow off; cut out all the Meat; lay them in Water all Night; then boil them very tender, and lay them in Water another Night; then drain them very well, and to three Pound of Citron take four Pound of fine Sugar and two Quarts of Water; make the Sugar and Water just warm, put in the Citron, boil it half an Hour, and set it by 'till the next Day; then boil it 'till it is very clear, and put in a Pound more of Sugar, just wet with Water, boiling it fast 'till it is melted: Put in the Juice of four Lemmons, and put it up in large Pots. Boil the Citron very tender, cut off all the yellow Rind, beat the White very well in a Tray, or wooden Bowl, shred the Rind, and to a Pound of the Pulp and Rind take a Pound and a Half of Sugar and half a Pint of Water; when it boils, put in the Citron, boil it very fast 'till it is clear; then put in half a Pint of Pippin-Jelly, and boil it 'till it jellies very well; then put in the Juice of a Lemmon: Put it in Pots or Glasses. Take the Flowers full blown, pick the white Leaves, and put them in Water an Hour or two; then put them into boiling Water, letting them boil 'till they are tender; then drain them from that Water, and let them lye in cold Water, 'till you make a Syrup of very fine Sugar, as much as you think will cover them; to a Pound of Sugar put three Quarters of a Pint of Water; and when the Syrup is cold, put in the Leaves, and let them lye all Night; scald them the next Day, and let them lye in the Syrup two or three Days; then make a Syrup, (if you have a Pound of the Flowers) with a Pound and Half of fine Sugar and half a Pint of Water; boil and skim it, and when it is cold, drain the Flowers from the thin Syrup, and put them in the Thick; let them lye two or three Days; then make them just hot, and in a Day or two more lay them out on Glasses: Spread them very thin, sift them with fine Sugar, and put them in a Stove: Four or five Hours will dry them on one Side; then scrape them on Paper with the wet Side uppermost, and set them in the Stove 'till they are almost dry; then pick them asunder, and let them be in a Stove 'till they are quite dry: You may put some of them in Jelly, if you like it. Take a red Earthen Pot, that will hold about four Quarts, (those Pots that are something less at the Top and Bottom than in the Middle) stick it pretty thick with the Sticks of a white Wisk, a-cross, one over the other; set it before a good Fire, that it may be very hot against your Sugar is boil'd; then take ten Pound of double-refin'd Sugar finely beaten, the Whites of two Eggs beaten to a Froth in half a Pint of Water, and mix it with the Sugar; then put to it a Quart of Orange-flower-water and three half Pints of Water, setting it on a quick Fire; when it boils thoroughly put in half a Pint of Water more to raise the Scum, and let it boil up again; then take it off and skim it; do so two or three Times, 'till it is very clear; then let it boil, 'till you find it draw between your Fingers, which you must often try, with taking a little in the Ladle; and as it cools, it will draw like a Thread; then put it into the hot Pot, covering it close, and setting it in a very hot Stove for three Days: It must stand three Weeks; but after the three first Days a moderate Fire will do; but never stir the Pots, nor let the Stove be quite cold: Then take it out, and pour out all the Syrup, the Rock will be on the Sticks and the Pot-sides: set the Pots in cold Water, in a Pan, on the Fire, and when it is thorough hot all the Rock will slip out, and fall most of it in small Pieces; the Sticks you must just dip in hot Water, and that will make the Rock slip off; then put in a good Handful of dry Orange-Flowers, and take a Ladle with Holes, and put the Rock and Flowers in it, as much as will make as big a Lump as you wou'd like; dip it in scalding Water, and lay it on a Tin Plate; then make it up in handsome Lumps, and as hollow as you can: When it is so far prepar'd, put it in a hot Stove, and the next Day it will stick together; then take it off the Plates, and let it lye two or three Hours in the Stove; if there be any large Pieces, you may make Bottoms of them, and lay small Pieces on them. Scald the Fruit, dry it well from the Water, and rub it through a Hair Sieve; stir it in a Pan over a slow Fire, 'till it is pretty dry; the stiffer it is, the better; then take two Pound of fine Sugar, sifted thro' an Hair Sieve, and a Spoonful of Gum-Dragon steep'd very well, and strain'd, and about a Quarter of a Pound of Fruit; mix it well with Sugar, beat it with a Biscuit-Beater, and take the Whites of twelve Eggs, beat up to a very stiff Froth; put in but a little at a Time, beating it 'till it is all in, and looks as white as Snow, and very thick; then drop it on Papers, and put it in an Oven; the Oven must be very cool, and shut up, to make them rise: The Lemmon-Biscuit is made the same Way, only instead of Fruit put in the Juice of three Lemmons; less will make two Pound; it must have Juice enough to make it to a Paste, and the Rinds of two Lemmons grated; and when it is beaten enough, put in a little Musk, or Amber, and drop and bake it as other. To make all Sorts of SUGAR-PASTE. Sift your Sugar thro' a Lawn Sieve, then sift some Starch as fine; to a Pound of Sugar put a Quarter of a Pound of Starch; make it of what Colour you please, into a stiff Paste; putting thereto Gum-Dragon well steep'd in Orange-Flower-Water; beat it well in a Mortar, and make it in Knots or Shells in a Mould or Moss, with rubbing it thro' an Hair Sieve: The Red must be colour'd with Carmine; the Yellow with Gumboodge, steep'd in Water, and put to the Gum; the Green is made with Yellow Gum, putting to it Stone-Blue steep'd in Water; the Brown with Chocolate, and the Blue with Smalt. Take two Pound of fine sifted Sugar, half a Pound of Chocolate grated, and sifted thro' an Hair Sieve, a Grain of Musk, a Grain of Amber, and two Spoonfuls of Ben; make this up to a stiff Paste with Gum-Dragon steep'd well in Orange-Flower-Water; beat it well in a Mortar; make it in a Mould like Almonds; lay them to dry on Papers, but not in a Stove. Sift fine Sugar thro' an Hair Sieve, and cover it with Carmine; wet it more than a Candy with Water; boil it pretty fast 'till it is almost at a Candy Height; then put in about three Drops of Spirit of Wormwood, and fill it into little Coffins made of Cards; when it boils in the Coffins it is enough; you must not boil above half a Pound at a Time, or less: The Spirit of Wormwood must be that which looks black, and as thick as Oil, and must have two or three Boils in the Cakes after you put it in. To make HONEYCOMB-CAKES of ORANGE-FLOWER-VIOLET of COWSLIPS. Take about half a Pound of fine Sugar, sifted thro' an Hair Sieve, wet it more than for a Candy, with Orange-Flower-Water, for the Orange-Flower-Cakes, and fair Water for the other Cakes; boil it almost to Candy Height, and then put in the Leaves of the Flowers; boil them a little in the Candy, or it will be too thin; then put it in Card-Coffins. Beat a Pound of Almonds very fine, with Rose-Water, to keep them from Oiling; mix them with half a Pound of sifted Sugar, make them up into little long or round Cakes, which you like best; put them in a Stove or before a Fire, 'till they are dry on one Side, and then turn them; and when they are dry on both Sides, take very fine Sugar sifted; to a Pound take as much White of Eggs as will just wet it; beat it with a Spoon, and as it grows white put in a little more Egg, 'till it is thin enough to ice the Cakes; then ice first one Side, and when that is dry before the Fire, ice the other: Be sure one Side is dry before you do the other. Blanch half a Pound of Almonds, slice them thin the long Way, lay them in Rose-Water all Night; then drain them from the Water, and set them by the Fire, stirring them 'till they are a little dry and very hot; then put to them fine Sugar sifted, enough to hang about them. (They must not be so wet as to make the Sugar like Paste; nor so dry, but that the Sugar may hang together.) Then lay them in Lumps on Wafer-Paper, and set them on Papers in an Oven, after Puffs, or any very cool Oven that Pies have been baked in. To make ORANGE or LEMMON-PUFFS. Take a Pound of fine sifted Sugar, and grate the Outside Rind of two large Oranges or Lemmons; put the Rind to the Sugar, and beat them well together in a Mortar; grind it well with a Pestle, and make it up to a stiff Paste with Gum-Dragon well steep'd; then beat the Paste again, rowl or square it, and bake it in a cool Oven, on Papers and Tin-Plates. To make ALMOND-PASTE, either BITTER or SWEET: The BITTER are RATAFEA. Blanch and beat a Pound of Almonds; put in just Rose-Water enough to keep them from Oiling; then take a Pound of fine Sugar, and boil it to a Candy; and when it is almost at a Candy Height, put in the Almonds; stir them over a cool Fire 'till it is a very dry stiff Paste, and almost cold, and set it by 'till it is quite cold; then beat it well in a Mortar, and put to it a Pound and a Half of fine sifted Sugar; rub it very well together, and make it up with a Spoonful of well-steep'd Gum-Dragon and Whites of Eggs, whip'd to a Froth; then squirt it, and bake it in a cool Oven; put into the Sweet-Almonds the Rind of a Lemmon grated, but none in the Bitter: If you don't make the first Paste stiff, they will run about the Oven. Bake them on Papers and Tin-Plates. To make LITTLE ROUND RATAFEA-PUFFS. Take half a Pound of Kernels, or Bitter-Almonds, beat very stiff, and a Pound and a Half of sifted Sugar; make it up to a stiff Paste with White of Eggs whip'd to a Froth; beat it well in a Mortar, and make it up in little Loaves; then bake them in a very cool Oven, on Paper and Tin-Plates. Take half a Pint of Milk and half a Pint of Cream, and put to it half a Pound of brown Sugar; melt and strain it thro' a Sieve; take as much fine Flower as will make one half of the Milk and Cream very stiff, then put in the other Half; stir it all the while, that it may not be in Lumps; then put in two Eggs well beaten, a little Sack, some Mace shred fine, two or three Cloves beaten: Bake in Irons. Beat a Pound of Almonds very fine, mix them well with three Quarters of a Pound of sifted Sugar, set them over the Fire, keep them stirring 'till they are stiff, and put in the Rind of a Lemmon grated; make them up in little Loaves, shake them very well in the Whites of Eggs beat to a very stiff Froth, that the Egg may hang about them; then put them in a Pan with about a Pound of fine sifted Sugar, shake them 'till they are well cover'd with the Sugar; divide them if they stick together, and add more Sugar, 'till they begin to be smooth, and dry; and when you put them on Papers to bake, shake them in a Pan that is just wet with White of Eggs, to make them have a Gloss: Bake them after Biscuit, on Papers and Tin-Plates. Take a Pound of fine sifted Sugar, and three Ounces of Chocolate grated, and sifted thro' an Hair Sieve; make it up to a Paste with White of Eggs whip'd to a Froth; then beat it well in a Mortar, and make it up in Loaves, or any Fashion you please. Bake it in a cool Oven, on Papers and Tin-Plates. To make RATAFEA-DROPS, either of APRICOCK-KERNELS, or half BITTER, and half SWEET-ALMONDS. Take a Pound of Kernels or Almonds beat very fine with Rose-Water; take a Pound of sifted Sugar and the Whites of five Eggs beat to a Froth, mix them well together, and set them on a slow Fire; keep them stirring, 'till they begin to be stiff; when they are quite cold, make them in little round Drops: Bake them after the long Biscuit, on Paper and Tin-Plates. To make all Sorts of SUGAR-PUFFS. Take very fine beaten Sugar, sifted thro' a Lawn Sieve, make it up into a Paste, with Gum-Dragon very well steep'd in Rose-Water, or Orange-Flower-Water; beat it in a Mortar, squirt it, and bake it in a cool Oven. Colour the Red with Carmine, Blue with Powder-Blue, Yellow with steep'd Gamboodge put into Gum, and Yellow and Blue will make Green: Bake them after all other Puffs. Sugar the Papers well before you squirt the Puffs on Papers and Tin-Plates. Lay a Pound of Almonds all Night in Water, and warm some Water the next Day to make them blanch, and then beat them very fine with Rose-Water; and to a Pound of Almonds take a Pound and a Quarter of fine Sugar; wet it with Water, boil it to a Candy Height, and then put to your Almonds three Spoonfuls of Rose-Water, mix it, and put it to the Candy; set it over the Fire 'till it is scalding hot, then put in the Juice of a Lemmon and the Rind grated; stir it over the Fire, and then drop it on Glass or clean Boards: Put it in a hot Stove; twelve Hours will dry it; then turn it, and dry it the other Side. Take thirty Eggs, (the Whites of fourteen (break twenty eight of them; beat them very well with two Spoonfuls of Rose-Water; then put in three Pound of sifted Sugar, and beat it all the while the Oven is heating; then dry two Pound and a Quarter of fine Flower, let it be cold before you put it in, and put in the two Eggs left out; stir it well, and drop it. It must have a very quick Oven. Bake it almost as fast as you can fill your Oven; the Papers must be laid on Tin-Plates, or they will burn at the Bottom. This fame Biscuit was the Queen's Seed-Biscuit. Put to half this Quantity half a Pound of Caraway-Seeds, and bake it in large square Tin-Pans, buttering the Pans: It bakes best in a cool Oven, after the Drop-Biscuit is baked. Take the Yolks of eighteen Eggs, beat them well, the Whites of nine whip'd to a Froth, and beat them well together; put to them two Pound and two Ounces of sifted Sugar, and have ready half a Pint of Water, with three Spoonfuls of Rose-Water, boiling hot; and as you beat the Eggs and Sugar, put in the hot Water, a little at a Time; then set the Biscuit over the Fire, (it must be beat in a Brass or Silver Pan) keeping it beating, 'till it is so hot that you can't hold your Finger in it; then take it off, and beat it 'till 'tis almost cold; then put in a Pound and Half of Flower well dry'd, and the Rind of two Lemmons grated. Bake it in little long Pans butter'd, and in a quick Oven: Sift Sugar over them before you put them in the Oven. To make round BISCUIT with CORIANDER SEEDS. Take nine Eggs, and but four of the Whites, beat them very well, put to them eight Spoonfuls of Rose-Water, and eight of Orange-Flower-Water; beat the Eggs and Water a Quarter of an Hour; then put in a Pound of sifted Sugar, three Quarter of a Pound of fine Flower well dry'd, beat this altogether an Hour and Half; then put in two Ounces of Coriander-Seeds a little bruis'd: When the Oven is ready, put them in little round Tin-Pans butter'd, and sift Sugar over them. A cool Oven will bake them. Take half a Pound of Hartshorn, boil it in a Pipkin, with six Quarts of Spring-Water, 'till consum'd to three Pints; let it stand all Night; then put to it half a Pound of fine Sugar, some Cinamon, Mace, and a Clove or two, and let it boil again; then put in the Whites of eight Eggs well beaten, letting it boil up again; then put in the Juice of four or five Lemmons, and half a Pint of Rhenish Wine; let it just boil up, and then run it thro' a Jelly-bag 'till it is clear. Take four Lemmons, rasp the Rinds into a Pint and half of Spring-Water, let it lye an Hour; and then put to it the Whites of five Eggs well beaten, half a Pound of Sugar, and the Juice of four Lemmons; when the Sugar is melted, strain it thro' a thin Sieve or Strainer; then take a little Powder of Turmerick, ty'd up in a Piece of Muslin, and lay it in a Spoonful of Water 'till it is wet; then squeeze a little into the Jelly, to make it Lemmon-Colour, but not too Yellow: Set it over the Fire, skim it, and when you see it jelly, put it in Glasses; if it boil, it will not be amiss. Rasp the Peel of two Oranges into half a Pint of Water; put to it half a Pint of Orange-Juice, and six Eggs, (but two of the Whites) and as much Sugar as will sweeten it; strain it, set it on the Fire, and when it is thick, put in a Piece of Butter as big as a Nut, keeping it stirring 'till it is cold. Take a Quartern of Eringo's, cut them small, and boil them in half a Pint of Milk, 'till they are tender; then put to them a Pint of Cream and two Eggs, well beaten; set it on the Fire, and let it just boil; if you don't think it sweet enough, put in a little Sugar. Take two Ounces of Pearl-Barley, boil it in four or five Waters 'till it is very tender; then rub it thro' an Hair Sieve, and put it to a Pint of Cream, with an Egg well beaten; sweeten it, and let it boil: If you please, you may leave some of the Barley whole in it. Take Kernels of Apricocks, beat them very fine, and to two Ounces put a Pint of Cream and two Eggs; sweeten it, set it on the Fire, and let it boil 'till 'tis pretty thick: You may slice some of the Kernels thin, and put them in, besides what is beaten. Take half a Pound of Almonds finely beaten, mix them in a Quart of Cream; strain the Cream, and get out as much of the Almonds as you can thro' the Strainer; set it on the Fire, and when it is ready to boil, put in twelve Eggs (but three of the Whites) well beaten; stir it on the Fire 'till it turns to a Curd; then put in half a Pint of cold Milk, stir it well, and whey it in a Strainer: When 'tis cold sweeten it. Take a Pint of Cream, and boil it, and when it is almost cold, sweeten it, and put it in the Bason you use it in; and put to it a Spoonful of Runnet; let it stand 'till it comes like Cheese: You may perfume it, or put in Orange-Flower-Water. To make all Sorts of FRUIT-CREAM. Take your Fruit, (scalded) or Sweet-meats, and rub it thro' an Hair Sieve, and boil your Cream; and when 'tis cold, put in your Fruit, 'till 'tis pretty thick. To make SACK-POSSET, or SACK-CREAM. Take twelve Eggs, (the Whites of but six) beat them, and put to them a Pint of Sack and half a Pound of Sugar; set them on a Fire, keeping them stirring 'till they turn white, and just begin to thicken; at the same Time on another Fire have a Quart of Cream, boil and pour it into the Eggs and Sack, give it a Stir round, and cover it a Quarter of an Hour before you eat it: The Eggs and Sack must be heated in the Bason you use it in, and the Cream must boil before you set on the Eggs. Take two Ounces of Ising-glass, steep it all Night in Rose-Water; then take it out of the Water and put to it a Quart of Milk, and about six Laurel Leaves, breaking the Leaves into two or three Pieces; boil this 'till all the Ising-glass is dissolv'd, and the Milk diminish'd to less than a Pint; then put to it a Quart of Cream, letting it boil about half an Hour; then strain it thro' a thin Strainer, leaving as little of the Ising-glass in the Strainer as you can; sweeten it, and, if you like it, put in a little Orange-Flower-Water; put it in a broad Earthen Pan, or China Dish; the next Day, when you use it, cut it with a Jagging-Iron in long Slips, and lay it in Knots on the Dish or Plate you serve it up in. Take a Pint of Cream, the Yolks of two Eggs, and about a Quarter of a Pound of Sugar, boil'd with the Rind of a Lemmon cut very thin; when it is almost cold, take out the Rind, and put in the Juice of a large Lemmon, by Degrees, or it will turn, keeping it stirring 'till it is quite cold. Take half a Pound of Green Citron, cut it as thin as possible, and in small long Pieces, but no longer than half an Inch: Put it in a Pint of Cream, with a Piece of the Rind of a Lemmon, and boil it a Quarter of an Hour; then sweeten it, put in an Egg well beaten, and set it on the Fire again, 'till it grows thick; then put in the Juice of half a Lemmon, and stir it 'till 'tis cold. Take half a Pound of Pistato-Nuts, break them, and blanch the Kernels, and beat all (except a Dozen, that you must keep to slice, to lay on the Top of the Cream) with a little Milk; then put them into a Pint of Cream, with the Yolks of two Eggs, and sweeten it with fine Sugar: To this Quantity put a Spoonful of the Juice of Spinage, stamp'd and strain'd; set it all over the Fire, and let it just boil; and when you send it up, put the slic'd Kernels on the Top. If you like it thick, you may put in the White of one Egg. Take four Gallons of Milk, let it just boil up; then put in two Quarts of Cream, and when it begins to boil again, put it in two large Pans or Trays, letting it stand three Days; then take it from the Milk with a Skimmer Skimmer full of Holes, and lay it in the Dish you send it up in: Lay it high in the Middle, and a large handsome Piece on the Top, to cover all the rest. To make a very thick, raw CREAM. Take two Trays, keep them boiling hot; and, when you bring your Milk, put it in the scalding-hot Tray, and cover it with the other hot Tray; and the next Day you will find a very thick Cream. This must be done the Night before you use it. Take two Gallons of Milk, boil it, and, whilst boiling, put in a Quart of Cream; let it boil after the Cream is in; set it in two broad Pans or Trays, and let it stand two or three Days; then take the Cream from the Milk into a Silver Pan or wooden Bowl; put to it a Spoonful of Orange-Flower-Water, with a perfum'd Pastel or two melted in it; and sweeten it a little with sifted Sugar: Then beat it with a Silver Ladle or a wooden Beater, 'till it is stiff enough to lye as high as you wou'd have it: Be sure to beat it all one Way, and not change your Hand. Take the Rind of two or three Oranges, and boil them very tender; then beat them very fine in a Mortar, and rub them thro' an Hair Sieve; then take a Quart of Cream, boil it, and put in the Yolks of ten Eggs, and the Whites of two; beat the Eggs very well before you put them to the boiling Cream; stir it all one Way, 'till it is a Curd; then whey it in a Strainer; when it is cold, mix in as much of the Orange as you think will make it taste as you wou'd have it; then sweeten it as you like it. Take a Pint of Milk, and about twelve large Laurel Leaves, break the Leaves in three or four Pieces; boil them in the Milk 'till it is half wasted; then put in a Quart of Cream, boil it with the Leaves and Milk; then strain it, and set it on the Fire again; when it boils, put in the Yolks of twelve Eggs, and the Whites of three, beating the Eggs very well; stir this 'till it is a Curd; put in about Half a Pint of Milk, let it have a boil, then whey it in a Strainer. When it is cold, sweeten it. This tastes as well as that which has Almonds in it. Have three or four long Baskets made like a Fish; then take a Quart of new Milk and a Pint of Cream, sweeten it, and put in a little Orange-Flower-Water; make it as warm as Milk from the Cow; put in a Spoonful of Runnet, stir it, and cover it close; and when it comes like a Cheese, wet the Baskets, and set them hollow; lay the Cheese into them without breaking the Curd; as it wheys and sinks, fill them up 'till all is in. When you send it up, turn the Baskets on the Plates, and give it a Knock with your Hand, they will come out like a Fish: Whip Cream and lay about them. They will look well in any little Basket that is shallow, if you have no long ones. Take a Quarter of a Pound of Almonds, blanch and beat them very fine, put them to a Pint of Cream, boil the Almonds and Cream, then sweeten it, and put it in the Whites of two Eggs well-beaten; set it on the Fire till it just boils and grow thick. To make RAW-ALMOND, or RATAFEA-CREAM. Take a Quarter of a Pound of bitter or sweet Almonds, which you like best, blanch and beat them very fine, mix them with a Quart of Cream and the Juice of three or four Lemmons; sweeten it as you like it, and whip it in a Tray with a Whisk; as the Froth rises, put it in a Hair Sieve to grow stiff; then fill your Bason or Glasses. Take a Quarter of a Pound of Chocolate, breaking it into a Quarter of a Pint of boiling Water; mill it and boil it, 'till all the Chocolate is dissolv'd; then put to it a Pint of Cream and two Eggs well-beaten; let it boil, milling it all the while; when it is cold, mill it again, that it may go up with a Froth. Take two Spoonfuls of Sego, boil it in two Waters, straining the Water from it; then put to it half a Pint of Milk, boil it 'till 'tis very tender, and the Milk wasted; then put to it a Pint of Cream, a Blade of Mace, a little Piece of Lemmon-Peel, and two Eggs, (the White of but one) sweeten and boil it 'till it is thick. Take Tin Ice-Pots, fill them with any Sort of Cream you like, either plain or sweeten'd, or Fruit in it; shut your Pots very close; to six Pots you must allow eighteen or twenty Pound of Ice, breaking the Ice very small; there will be some great Pieces, which lay at the Bottom and Top: You must have a Pail, and lay some Straw at the Bottom; then lay in your Ice, and put in amongst it a Pound of Bay-Salt; set in your Pots of Cream, and lay Ice and Salt between every Pot, that they may not touch; but the Ice must lie round them on every Side; lay a good deal of Ice on the Top, cover the Pail with Straw, set it in a Cellar where no Sun or Light comes, it will be froze in four Hours, but it may stand longer; than take it out just as you use it; hold it in your Hand and it will slip out. When you wou'd freeze any Sort of Fruit, either Cherries, Rasberries, Currants, or Strawberries, fill your Tin-Pots with the Fruit, but as hollow as you can; put to them Lemmonade, made with Spring-Water and Lemmon-Juice sweeten'd; put enough in the Pots to make the Fruit hang together, and put them in Ice as you do Cream. Take half a Pound of Hartshorn, boil it in four Quarts of Water till it comes to one, or less; let it stand all Night; then beat and blanch a Quarter of a Pound of Almonds, melt the Jelly, mix the Almonds with it, and strain it thro' a thin Strainer or Hair Sieve; then put in a Quarter of a Pint of Cream, a little Cinamon, and a Blade of Mace, boil these together, and sweeten it: Put it into China Cups; when you use it, turn it out of the Cups, and eat it with Cream. Take a Pound of Sugar sifted thro' a Lawn Sieve, two Grains of Amber-Grease, one Grain of Musk; grind the Amber and Musk very fine, mix it with the Sugar, make it up to a Paste with Gum-Dragon well steep'd in Orange-Flower-Water, and put in a Spoonful of Ben; beat the Paste well in a Mortar, then roll it pretty thin, cut the Pastels with a small Thimble, and print them with a Seal; let them lye on Papers to dry; when they are dry, put them in a Glass that has a Cover, or in some close Place, where they may not lose their Scent. Take a Pound of Jordan-Almonds, set them before a hot Fire, or in an Oven, 'till they are very crisp; then take three Quarters of a Pound of Sugar, one Ounce of Chocolate grated, and a Quarter of a Pint of Water, and boil these almost to a Candy; then put in the Almonds, and let them be just hot; take them off and stir them, 'till the Sugar grows dry, and hangs about the Almonds: Put them out of the Pan on a Paper, and put them asunder. Take fine sifted Sugar, and put it in Spoons, colouring it in every Spoon of several Colours; wet it with Juice of Lemmon; this is to paint the Wafers. Cut little square Papers, of very thick but very fine Paper, (a Sheet will make two Dozen) then take a Spoonful of Sugar, wet it with Juice of Lemmon, let it be pretty stiff, hold the Spoon over the Fire 'till it grows thin, and is just scalding hot; then put a Tea-Spoonful on the Paper, rubbing it equally all over the Paper very thin; then paint it of what Colour you please, first scalding the Colours: When you see it grows dry, pin it at two Corners of the Paper; when they are cold, and you have made all you design to make, put them into a Box, and set them a Day or two by the Fire; then wet the Papers, with your Fingers dipt into Water, on the Outside; let them lye a little, and the Papers will come off. The Colours are made thus: The Red with Carmine, the Blue with Smalt, the Green with Powder, call'd Green-Earth, and the Yellow with Saffron steep'd in Lemmon-Juice. Lay the Oranges in Water three Days, shifting them every Day; then put them into scalding Water, keeping them in a Scald, close cover'd, 'till they are green; then boil them 'till they are tender, and put them in Water for three Days more, shifting the Water every Day: Make a Syrup with their Weight in Sugar, Half a Pint of Water to a Pound of Sugar; when the Syrup is cold put the Oranges into it; let them lye two or three Days, and then candy them out as other Oranges. To candy COWSLIPS, or any FLOWERS or GREENS in BUNCHES. Steep Gum-Arabick in Water, wet the Flowers with it, and shake them in a Cloth, that they may be dry; then dip them in fine sifted Sugar, and hang them on a String, ty'd cross a Chimney that has a Fire in it: They must hang two or three Days 'till the Flowers are quite dry. Take China Oranges, peel and split them into Quarters, but don't break the Skin; lay the Quarters before a Fire, turning them 'till the Skin is very dry; then take Half a Pound of Sugar sifted thro' an Hair Sieve, put it in a Brass or Silver Pan, and set it over a very slow Fire, keeping it stirring 'till all is melted, and looks pretty clear; then take it off the Fire, and put in your Orange-Quarters, one at a Time; take them out again as fast as you can with a little Spoon, and lay them on a Dish, that shou'd be butter'd, or they will not come off: The Sugar will keep hot enough to do any Plate full. You may do roasted Chessnuts, or any Fruit in the Summer, first laying the Fruit before a Fire, or in a Stove, to make the Skin tough; for if any Wet come out, the Sugar will not stick to it: It must be done just when you use it, for it will not keep. To make a good GREEN. Lay an Ounce of Gumboodge in Water 'till it is all melted, Half a Quarter of a Pint of Water is sufficient; then take an Ounce and Half of Stone-Blue dissolv'd in a little Water, put it to the Gumboodge when melted; put to it a Quarter of a Pound of fine Sugar, and a Quarter of a Pint of Water more, and let it boil: Put a Spoonful of this to a Pint of any white Clear-Cakes, it will make them a very good Green. Beat the White of an Egg, and dip the Fruit in it; let it lye on a Cloth that it may not wet; then take fine sifted Sugar, and rowl the Fruit in it 'till 'tis quite cover'd with Sugar; lay it on a Sieve in a Stove, or before a Fire, to dry it well; it will keep well a Week. To scald all Sorts of FRUIT. Put the Fruit into scalding Water, (as much as will almost cover the Fruit) set it over a slow Fire, keep them in a Scald 'till they are tender, turning the Fruit where the Water does not cover it; when 'tis very tender, lay a Paper close to it, and let it stand 'till it is cold: Then to a Pound of Fruit put Half a Pound of Sugar, and let it boil (but not too fast) 'till it looks clear: All Fruit must be done whole but Pippins, and they are best halv'd or quarter'd, and a little Orange-Peel boil'd and put in them, with the Juice of a Lemmon.